Onward through the alphabet! 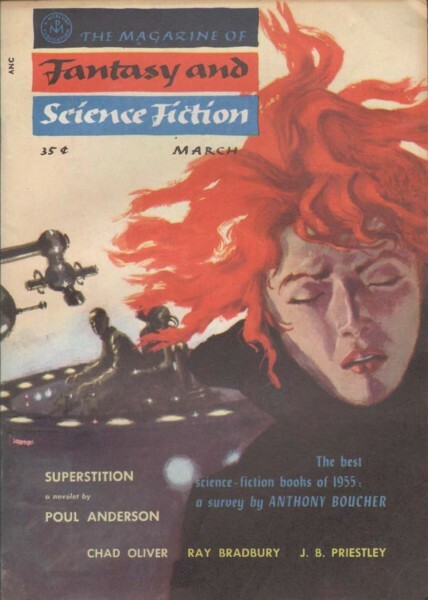 Today's chunk of Tom Boardman, Jr.'s 1966 anthology An ABC of Science Fiction covers those stories by writers representing the letters R, S, T and U. Russell and Simak are prominent writers (titan of SF publishing John W. Campbell, Jr. once told Alan Dean Foster that Russell was his favorite writer, while Simak in the 1977 was the third person awarded the title Grandmaster) with whom I am somewhat familiar, while Tenn I have heard of but never read and Urban I don't know that I have ever heard of. Back in 2016 we read The Best of Eric Frank Russell; "Love Story," which first appeared in Astounding, was not in that collection. 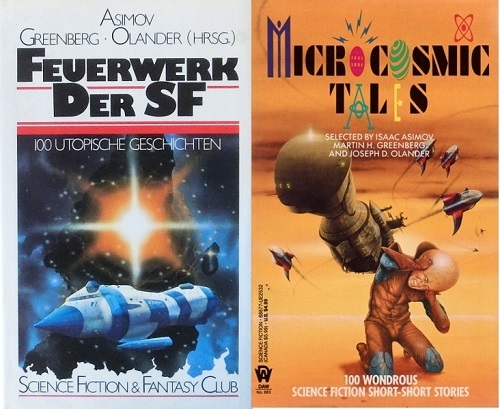 It was reprinted, however, in Microcosmic Tales, a collection of 100 short-shorts, and similar German collections. As short-shorts go, "Love Story" is inoffensive; it is competent filler, and I'm grading it "acceptable." It is not really a science fiction story, though, more like a mainstream story set in the future, that could probably have been set in ancient Rome or Victorian Britain or something. "Love Story"'s four pages relate a conversation between General Romaine and his colleague (I guess his aide-de-camp or something) Harding. (General Romaine's hick cousin Iceberg and his snobby brother-in-law Arugula do not appear in this story.) Romaine has to send three regiments (these are big regiments, with six thousand men each) from the Centauri region to the newly acquired Sirius region, and he is annoyed that so many men are trying to get out of going because they don't want to leave their wives and families. He thinks a spaceman should renounce love, "as if he were a monk" and devote himself to serving Earth and dominating the cosmos. 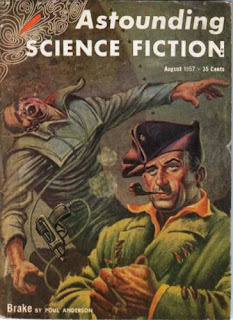 Romaine goes on in this anti-love vein for a while, and then Harding points out a letter from a Sergeant Amadeo who says he doesn't want to leave Centauri because he had hoped to dedicate his life to the Centaurian Guard and doesn't want to be reassigned to the Sirian Holding Force: "they have taken away my helmet-badge, the silver horse of Centauri...." This is a kind of love Romaine can respect, and he grabs the phone and pulls strings to keep Amadeo in his current unit and even sets Amadeo on the path to becoming a commissioned officer. "Love Story" isn't exactly impressive, but it achieves its goals and is not irritating, so it is better than the last four stories we've read in An ABC of Science Fiction. 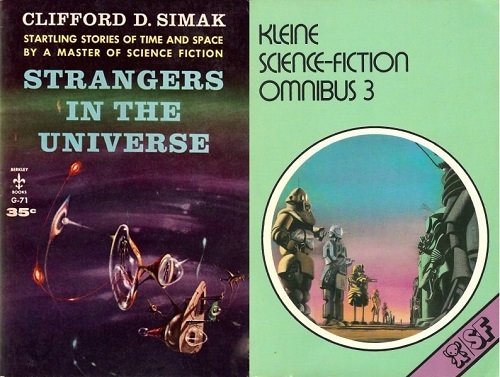 Earlier this year I considered embarking on a personal Frederik Pohl renaissance, Pohl being another author whom I read a lot of in my Garden State youth, but Starburst cooled me on the idea, and "The Bitterest Pill" hasn't reignited it. Maybe "The Fence" is going to get me to (re)read some Simak novels? The one I have fondest memories of is Heritage of Stars, but the one I actually own is The Visitors. Well, let's see. "The Fence" is a story about a writer who is worried nobody will ever read the stuff he spends hour after hour laboriously researching and writing! That is hitting a little too close to home, I daresay! It is the far future, so far that people don't have to work for money or food, murder is almost unthinkable, and the idea of marrying a woman and having kids with her seems "just a bit obscene" to our protagonist, Craig the historian. Craig has a machine that can view the past, and he is conducting a detailed survey of events taking place in a single acre over thousands of years. But lately his work seems a waste of time, and his Personal Satisfaction rating (P. S.) has dipped from 120 last year to a mere 75. (P. S. scores are reported on a ticker tape that everybody can see.) Craig goes to see a shrink, makes little progress, goes for a walk. On his walk Craig meet a guy who is living "off the grid." This joker, Sherman, says that people have it too easy now, that everything is handed to them so they feel no real satisfaction. Sherman makes his own way, growing his own vegetables, trapping rabbits in snares and catching fish on a hook--he has satisfaction because he doesn't live on handouts. Craig realizes that he is not sure where all the free stuff like food and clothes and energy that everybody except Sherman takes advantage of comes from, and Sherman subtly guides him to clues that suggest that aliens are keeping the human race as pets, that we are the object of their contemptuous pity. 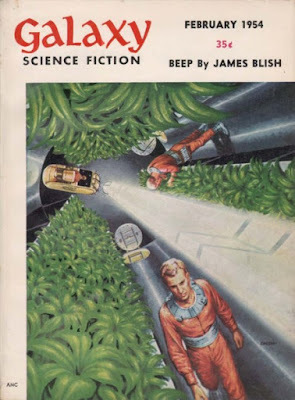 Here we have one of the few legitimately good stories I've encountered in An ABC of Science Fiction; smoothly written and with gentle jokes that are actually amusing and philosophical ideas that actually deserve respect--thumbs up! Like so many other stories in this anthology it is a pessimistic piece that portrays humanity as defeated and deceived, but it has a seriousness and maturity about it, and leaves room for a glimmer of hope in the form of Sherman, the man who has decided to live his own life as much as he can in manly defiance of the degrading conditions he finds himself in. Simak is giving Brian Aldiss a run for his money in the contest of who has the best story in this anthology. "The Fence" first appeared in Space Science Fiction and has been reprinted numerous times in various languages. 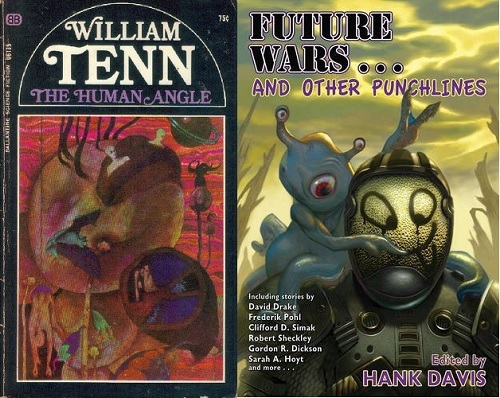 I've always avoided Tenn's work, I think because I have got the idea he writes sarcastic satiric joke stories like Robert Sheckley and Ron Goulart, two writers I have written off. I am sick of parodies (when you just imitate something else, like plunking Homer Simpson down in the same milieu as The Prisoner) and I am sick of comedy that is just mean-spirited score-settling with your political or class enemies. I saw part of a Marx Brothers movie recently, and it just seemed to be about Groucho swindling and physically abusing others with his superior wit. Am I supposed to identify with Groucho as he humiliates people? I'm not the kind of person who humiliates people--I am the kind of person who gets humiliated! I was sympathizing with Groucho's victims! I like comedy that is based on human fallibility and human relationships. I laugh every time I see Laurel and Hardy in Block-heads or Chickens Come Home, I love I Love Lucy and the original Flintstones and the first TV version of The Odd Couple (I am told there are other versions)--I can identify with screw ups who have been defeated by life, people who set themselves impossibly lofty goals and fall on their faces in pursuit of them. My suspicions about Tenn are more a case of my spider-sense tingling than any actual direct or indirect research. Well, today we conduct a little research in the primary sources! I guess you could call "Project Hush" a joke story, a satire of government and the military, but Tenn plays it straight and the jokes consist of believable events and realistic dialogue, nothing absurd or over the top. Our narrator, and his subordinates, are academics who have been mustered into the US Army and are leading the project of building a secret base on the moon from which to protect the USA from foreign attack. (It is not made clear how a base on the moon will protect us from the USSR or Red China or whoever better than a base in Europe or Japan or something, but might as well just go with it.) Our heroes secretly cross the void and are setting their dome up on Luna when a recon mission reveals that there is another dome on the Moon already! Is it aliens? Is it hostile foreigners? Throughout the story the narrator has stressed again and again how the Army has striven to keep its moon base effort secret, and the punchline to the story is that the other dome has been set up by the US Navy, which has its own moon base project, just as secret as the Army's. Marginally good; all the military and technology stuff feels real, as if this were a hard SF story, which I guess it kind of is, and as I have suggested the comedy stuff doesn't distract you from the story. Maybe I have been unfair to Tenn and should look for more stories by him in my anthologies. 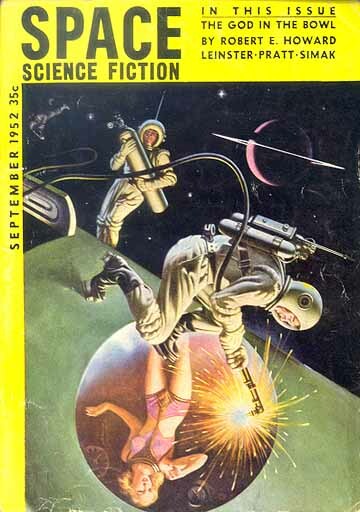 Originally appearing in Galaxy, "Project Hush" has been reprinted many times in compilations of short-shorts and anthologies of humor pieces, as well as Tenn collections. Urban has only six stories listed at isfdb. After its initial printing in F&SF, "The Finer Breed" only ever appeared here in An ABC of Science Fiction. "The Finer Breed" appears to be a spoof of advertising, TV and popular psychology, in particular specific verbal strategies or tics emerging at the time it was written. The sometimes odd grammar and syntax of the story related to use and overuse of comparatives and superlatives (a lampoon of advertising verbiage and its alleged malign influence on ordinary people's grammar, I guess) make the story clunky to read, and its apparent reference to cultural trends from 15 years before I was born shook my confidence that I was really grasping what was going on. Maybe Urban is referring to a specific TV commercial or ad campaign with which I am not familiar? The twist ending of the four-page story is that the captain of Northwest Station breaks the strange grammar rules of this future and has himself committed. This story was annoyingly opaque the first time I read it and I was ready to give it a thumbs down, but on a second, more careful, read I think I sort of get it. I didn't really enjoy it, but maybe somebody more familiar with the cultural artifacts or phenomena which Urban is parodying here might find "The Finer Breed" an amusing or interesting historical document. Let's call it acceptable. A much better batch of stories than the last one. 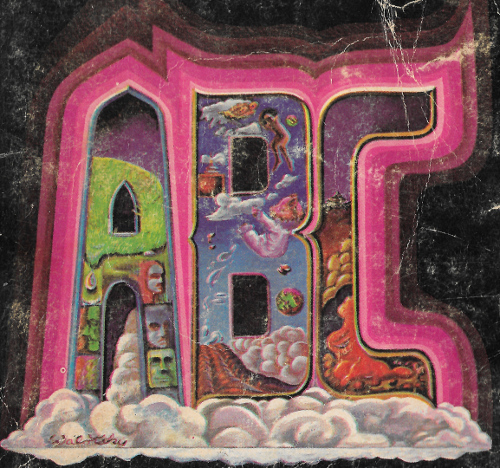 In our next episode we'll finish our odyssey through the alphabet as represented by SF authors selected by Tom Boardman, Jr.